Juliet takes her time at weaving a beautiful story. You really get to know the main characters and feel like they are real people. I loved it! I am a big fan of juliet's books and stories, and this one is the best she has ever written. I first bought all the paperbacks in Dutch, then i bought them in epub in Dutch, and now i buy them all in English. I find it even better in English, the fey world is realistic. I never want to return to the real world again. Though predictable on some plot points, this is nonetheless well-written, with characters one knows and believes immediately. I love historical fiction that teaches as it entertains, and this is the best I've read in ages. I will most certainly be reading more of Blackthorn and Grim's adventures! One of my Christmas books, Dreamer's Pool had been on my TBR list for quite a while. Recommended by my buddy, author Allison Temple, as one of her favourite reads , it sounded like something I would enjoy and I waited for it to go on sale in ebook. It never did. *LOL* So Michael bought me the mass market paperback for Christmas. Bit of a brick, it is! But it was really really good! It was not what I was expecting. I had thought it'd be something like Grace Draven's Master of Crows, a romance with fantasy woven in. What I got was more along the lines of Blair MacGregor's - one of my favourite fantasy authors - Desert Rising books. Fantasy for grown-ups with mature themes and thoughtful, learning, growing characters. At least the main story about Blackthorn and Grim. Two amazing characters that are so broken and beaten you wonder how they've managed to survive past the first chapter! And while there might not have been romance as I had expected, there is certainly love in this book. At least in the main story about Blackthorn and Grim. Two amazing characters that are so broken and beaten you wonder how they've managed to survive past the first chapter! But both Blackthorn and Grim have a thread of steel in them. A core of good. And maybe even a bit of altruism on top of that. We discover more and more of this as the book goes on, which is a delightful journey. But dear Lord, when we first meet them they are quite at the nadir of their lives. Don't mistake me though, Blackthorn is as prickly as her name and I love her for it - and Grim, well, I do want to know about his past and what has brought him to be the Grim he is now. 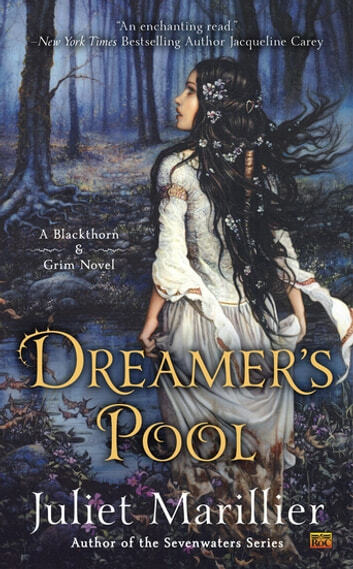 The book rotates 1st person POV between three characters: Blackthorn, the wise woman, Grim, her erstwhile friend and protector, and Oran, the prince of Dalraida. Oran is a sweet fellow. Scholarly almost. And he's waiting impatiently for the arrival of his bride, Flidais, who, when she arrives, is not quite as expected and thereby hangs the tale. I will admit, for the first half of the book I was not thrilled with Oran. I found him quite bland and even whiny. But then he sort of woke up and he got better. Never as enthralling as Blackthorn or Grim, but bearable at the very least. :) I like the way Juliet Marillier writes. I realised that every time I had a spare 5 minutes I was sneaking in a few more pages, a sure indication that I was quite entranced. Be sure I'll be reading the next two books!